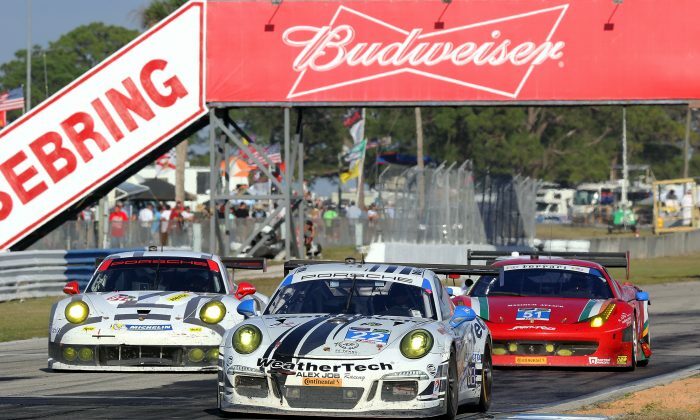 SEBRING, Fla.—The Tudor United Sportscar Championship wants to be the premier professional sports car racing series in North America. TUSC wants to be where all the top professional teams come to compete, and where all the biggest sponsors spend their money. Most of all, TUSC wants to be the series every sports car fan watches, because without a fan base, there will be no sponsors, no teams, and no series. Of course, professional sports series need professional officiating. No team is going to compete in a league where the refs make wrong calls, and no sponsor is going to fund that league. Most important, no fan is going to put up with seeing a favorite team get shafted by a bad call, or care about the outcome of an event knowing that that outcome might be skewed by stupid officiating. The worst possible bad call is a game-changing mistake, an obviously wrong decision which robs the winner and rewards the loser. For a fan, that is just too painful, too emotionally draining. Fans can spend their time watching sports with satisfying outcomes, rather than investing hours getting more and more excited about a match, only to be totally jerked around at the finish. Further, totally blowing an important call is wholly and completely unprofessional. Can it happen? Sure—that’s why professional leagues have instant replay. But professional sports leagues also are supposed to have the best officials, who simply do not blow important calls. Some things happen too quickly for the human eye to catch, but most calls can be made correctly by a very skilled umpire, and to be a top-tier professional series in any sport, the officials need to be as skilled as the players. TUSC cannot become a top-tier professional racing series through PR and spin. It needs to put on a pro-level show in every aspect of its public presentation. And after its two biggest races its record is 0–2. The biggest events of the TUSC season are the first two: the Rolex 24 at Daytona and the Sebring 12 Hours. Both have more than half a century of history, both attract international attention. Obviously, the first time a new series presents its version of these two iconic sports car events, that series needs to get everything right—or at the very least, it needs to nail the big, obvious things. TUSC blew an important call in the closing minutes of the Rolex 24 at Daytona, handing the GTD class “win” to Flying Lizards Motorsports, only to rescind the decision three hours later and give the trophies to Level 5. Considering that this was TUSC’s debut event, one would think that the officiating crews (veterans of 15 years of Rolex and ALMS) would be absolutely sure to get it right. Making a game-changing mistake after 23.9 hours of racing, on television, would surely be something to avoid at all costs? Worse still, once the series realized it might have made a mistake, it dithered about for three hours before making an announcement. TUSC has cameras everywhere around the track, and on top of every car. Every car has a radio transponder, and every car has a data logger—TUSC’s review options make the NFL’s look amateur. TUSC officials could have thoroughly analyzed the Flying Lizard/Level 5 situation while the other three classes were going through their awards ceremonies and likely could have had the matter resolved in time to put the right team on the podium. Instead, TUSC didn’t make a decision until three hours later, by which time all the TV crews had departed and the real winning team didn’t get any exposure for itself or its sponsors. Obviously it didn’t take three hours to review the data—so what took so long? Probably figuring out the politics of it—deciding how to save face for the series without completely alienating the teams. Possibly the series decided that it would be better to put someone on the podium quickly for the TV cameras, hoping no one would notice that it was the wrong team. Problem is, the teams, sponsors, and fans actually pay attention. It would be easier, one would think, to simply be really careful about late-race calls involving the class-leading cars. A correct decision one lap later sure beats a corrected decision three hours later. Yes, the officials look like they are in charge and on top of the game when they make quick, decisive calls—but they need to be the right calls. Badly blowing a game-changing decision is a lot worse than making fans and teams wait a few minutes for the right decision. TUSC most obviously didn’t learn this lesson. Many Cameras, Many Eyeballs—Any Brains Attached? Instead, amazingly, the series made a much more egregious error, which again resulted in giving the GTD win to the wrong team. Just after eight hours into the race, the #22 Weather Tech/Alex Job Racing Porsche 911 GT America was assessed a stop-plus-eighty seconds penalty for avoidable contact with the #49 Spirit of Racing Ferrari 458. Team owner Alex Job tried to appeal the call, which is apparently not appealable under TUSC rules. Job, who was hoping to earn his tenth class win in his 25th 12 Hours, had every reason to appeal: his car had never made contact with the #49 Ferrari. TUSC officials reviewed the footage—five separate individuals according to John Dagys from Sportscar365.com—and every one of them misidentified the offending car, which was actually the #912 GTLM-class Porsche North America RSR. Clearly visible in the film was a logo for Michelin tires; the #22 Weather Tech/AJR car, like all GTDs, uses only Continentals. Do any of the officials who reviewed the tape know anything about the series? “It’s just mind-boggling to me that five different people looked at the video and couldn’t figure out it was the 911 RSR, not the WeatherTech car,” Job told Sportscar365. The penalty put the #22 Weather Tech car a lap down, and while the #22 was able to get its lap back, it could not catch the leaders and finished fourth. Finishing fourth meant no podium, no press, no TV exposure—basically no Return on Investment for the sponsors. Without the penalty, all other things being equal, the #22 would have won the class handily. Even if TUSC officials, who frankly admit to completely blowing the call, were to reinstate the #22 as class leader, nothing can make up for the lost publicity, nor missing the thrill of standing on the podium as the winner of America’s most important sports car race. Further, if TUSC were to act on Alex Job’s appeal, what about the entire GTLM podium? Every GTLM team has a legitimate complaint that the #912 Porsche should have a two minutes added to its time (the penalty plus the time to traverse pit road) which would make the #912 fourth in class. That probably isn’t the message that business-minded NASCAR, which ultimately owns TUSC, would prefer to send. The question now is, Does TUSC really want to be a top-tier professional racing series? Can TUSC be a top-tier professional racing series? How, given the vast array of talent drawn from its two component series, ALMS and Rolex, can TUSC continue to make mistakes that wouldn’t happen even in a ChumpCar race? How can TUSC continue to make officiating errors which would shame the umpire at an elementary school softball game? TUSC officials: you listened to the fans about some of the worst failures at Daytona. Bravo. You improved the media coverage, you let the cars race, you balanced the cars within classes brilliantly. All that means nothing, however, if you cannot get the easy calls right—if you get them so very wrong that it is astounding. Sports car fans across North America want a multi-class racing series which offers at least a dozen races per season, which offers serious endurance events, which features all the best cars, teams, and drivers available, and which visits all the classic North American venues. TUSC offers most of that. Fans, teams, and sponsors also want a series that is run professionally. One more failure like these two could sink the series—the fans won’t tolerate it, the teams won’t and the sponsors are in it for the exposure, and won’t want to be associated with a series which makes itself a joke when it is noticed at all. Please, pull it together. You have all the pieces in place to create a really successful—popular and profitable—racing series. Stop hurting yourselves. Hopefully it is not too late. Rolex 24: Did TUSC Hit a Homer or a Foul?